Many fans and netizens have already concluded that this movie would be 2015 MMFF’s Top-Grosser, merely due to the fact that it features the phenomenal “Kalyeserye” loveteam of Alden Richards and Maine Mendoza. Despite the highly competitive casting of other MMFF entries and the cutting-edge technologies they used, Aldub fans still believe that this movie of Bossing Vic Sotto is the one to beat when it comes to Box Office results. It would not even be a surprise if “My Bebe Love: #KiligPaMore” would get to win the Best Picture award. 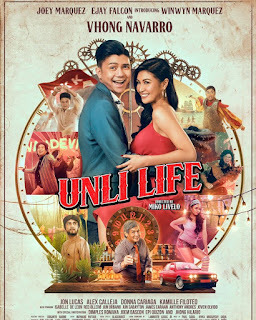 This romantic comedy flick is mainly about the story of Vito (Vic Sotto) and Cora (Ai Ai delas Alas) who started out as bitter business rivals of each other, but eventually got into an unexpected romantic relationship. Along with their unlikely love story is the blossoming of the romantic relationship between Dondi (Alden Richards), Cora’s nephew, and Anna (Maine Mendoza), Vito’s daughter. Included also to the movie’s cast are Arlene Muhlach, Valeen Montenegro, Ryan Yllana, and Sancho Vito delas Alas. Additionally, some of Eat Bulaga’s dabarkads such as Joey de Leon, Jose Manalo, Wally Bayola, Paolo Ballesteros, and Ryzza Mae Dizon, have special appearance in the movie. 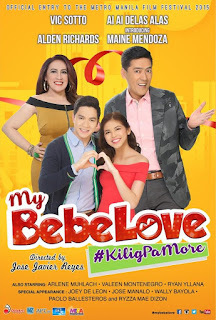 “My Bebe Love: #KiligPaMore” was directed by Jose Javier Reyes who also did the screenplay. It is actually a combined project of production companies APT Entertainment, GMA Films, M-Zet Productions, MEDA Productions, and OctoArts Films. This rom-com film will be released in theaters on December 2015 as one of the 8 contenders of the upcoming 41st Metro Manila Film Festival. Also, it was later on confirmed that the movie will also be released internationally, particularly in San Francisc o, Los Angeles, Sydney, and Melbourne. Producers are very confident that this project would be able to reach tremendous success that the contending MMFF entries could barely match with.